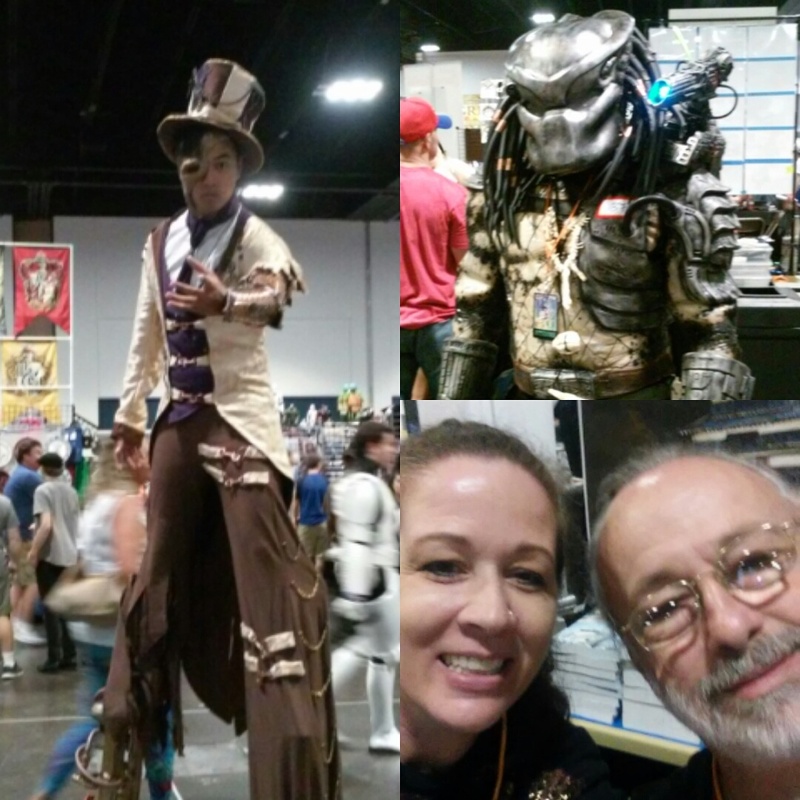 Two years ago, my family attended Tampa Bay Comic Con for the first time. (You can see my post about that here.) Last year, it just didn't work out for us to go at all. 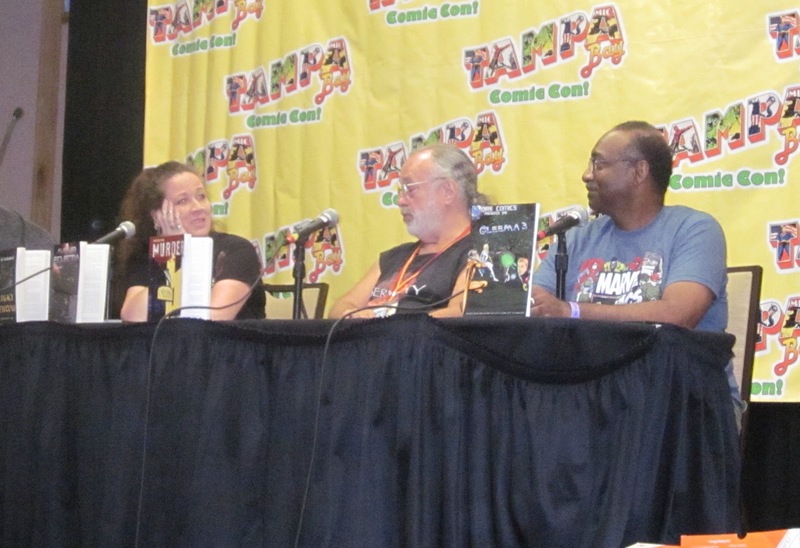 Well, one panel led to another, when an author had to back out. And then a third when a dear author friend recruited me for a panel he was on. It meant spreading my days out--early morning Saturday, late night Saturday, then again Sunday morning. So worth it, though. I had a blast and met some of the coolest people! The audience members asked all kinds of questions, as most of them were writers themselves. They were so kind and attentive and came up after the panels to talk to us panelists, and even buy some books. Tell me those costumes aren't cool! (If a bit blurry, because I forgot my real camera and had to use my phone.) The guy on stilts walked around like he did that all day normally. And Predator...well, come on. Fab. 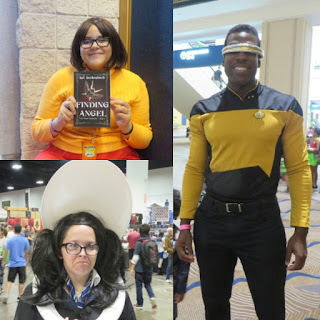 I did get some clearer pics Sunday, when I remembered my real camera....including Velma, who bought a copy of Finding Angel after hearing me talking to someone else about my books. Thank you, Velma! That Moaning Myrtle costume is just brilliant. And even though I knew this was not actually Levar Burton, I totally fan-girled at the sight of Geordi La Forge. I was leaving Comic Con after my time there Sunday morning -- panel, hanging out with Bill, walking the way too crowded vendor hall -- and when I got to the exit, I realized it was raining. Well, I had books in a basket and no way to keep them dry. I decided to try to find a plastic shopping bag or something to cover my books with, and I walked through the main hallway downstairs. Suddenly a guy comes up to me and asks if the books in my basket were books I wrote. Tall, youngish (in other words, obv younger than me), very sweet guy. I tell him, yes, they are. He asks if he can buy copies. He loves meeting authors, he tells me, and wants copies of whatever I have that I wrote myself. This, folks, is something that just makes an author's day. So, Josh, it was great meeting you, and thank you for making an already fantastic morning even more awesome! And that's it--my first time as a panelist at Comic Con. Next, I'll be doing panels again at Necronomicon in October. A smaller con, but oh, it's where my heart is! I've been attending Necro for years, doing panels there ever since Finding Angel released. I'll post here as soon as I have my panel schedule there. In the meantime, if you want more info, visit the Necro site HERE.